Finally! How has it taken me this long to write this blog? This is absurd. If I tried to post all of the pictures of me reading/writing with tea, we would literally be here forever. Drinking tea is my number one favorite thing to do when it comes to words, whether I’m writing or reading them. 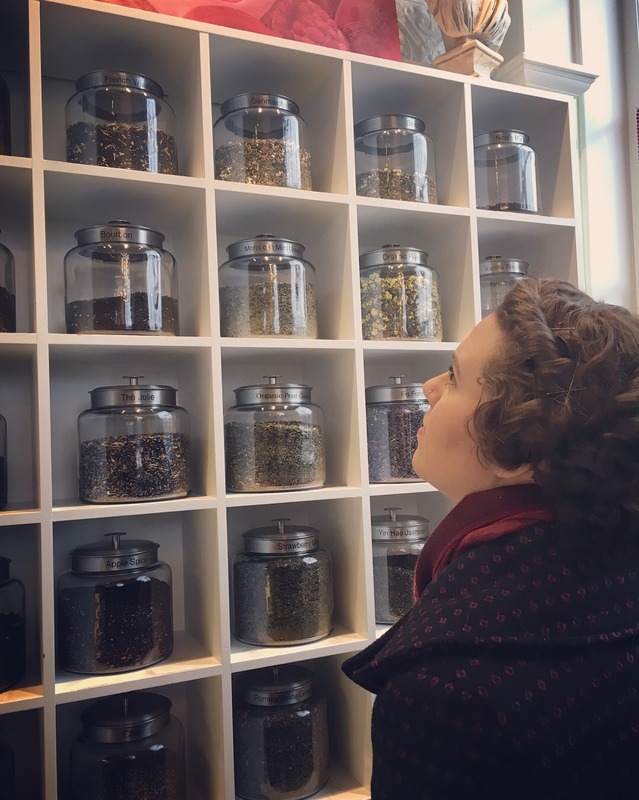 Thus, with this blog, I’d like to do two things–talk about my history with tea and feature two of my favorite tea companies ever, as well as a favorite accessory. I promise the history part of this will not be as long as they usually are. I actually didn’t start drinking tea until I was in college. Throughout elementary and middle school, my primary drink was water and occasionally soda. In high school, I found Monster, and I was in heaven. I tried to drink them sparingly, but by the time I got to college, I was drinking one a day, and let me tell you, this was not a healthy lifestyle or good financial idea. They’re so freaking expensive. I drank a Monster a day every single day for four years in college, but I also started drinking tea. I started small–just the Lipton green teas that had a little flavor in them. Lemon, mint, and pomegranate were my favorites, though it was really only on occasion. When I graduated college, I was still drinking Monster every day until a few months after I was promoted to a manager at my then-job. I’d started to notice that I’d gained a lot of weight while at college, and everyone around me was saying that cutting out the Monster would be a huge factor in losing weight. It got to the point where I just couldn’t stand looking in the mirror anymore, so I polished off my last can and quit cold turkey. The next logical step seems to be that tea took its place, right? No. Because I like to make everything as difficult as possible, I also quit soda and let my only drink be water or occasionally juice. Tea didn’t come for a while, and when it did, it was a slow experiment. I absolutely hated English Breakfast, but Tazo’s Vanilla Caramel chai sounded good, so I gave that a whirl and was in love. I thought not liking English Breakfast meant I didn’t like black tea, so I stayed away from it for a few years, only trying different herbal teas. The Lipton greens and I had a falling out, as well, so I didn’t try any of the Tazo greens. For some time, it was just Tazo’s Cinnamon Chalet herbal and the Mint Mosaic herbal. I started to develop this thing where every single time someone was drinking onscreen, I suddenly needed to be drinking it, too. This quickly progressed into a full-blown Thing when I fell in love with actor Ben Whishaw and started watching everything of his. I was absolutely enamored with his show The Hour, and I would stay up late sipping my chai or herbal while watching episodes over and over again. And then, a fateful thing happened. Oh, lord. So, first, that’s Ben Whishaw. I first discovered him in Cloud Atlas in college and over the next several years devoured everything he had ever been in. And then, in 2012, I became a Bond girl, and I will be the first to admit that it is 100000% because of the new Q. When Skyfall came out, I’d already seen the first two Craig Bonds, but never really paid them much mind, but Ben Whishaw? As Q? Yeah, okay, sign me up. It, uh–I’m ashamed to say it didn’t take that long before I wanted to try Earl Grey, Q’s go-to tea. So, I bought the Tazo Earl Grey (ew) and gave it a sip. Do yourself a favor and a half and try this Earl Grey by Two Leaves and a Bud. It’s organic loose leaf, and it’s like sipping the nectar of the gods. Just–wow. I drink it sparingly because only ten come in a pack and I like to actually sit with my Earl Grey rather than drink it in a travel mug, so I usually drink it on the weekends in my Mt Washington mug while reading in the morning. Everything is better with a cup of Earl Grey. I’ve also discovered that everyone I’ve asked either likes Earl Grey or English Breakfast and despises the other. Let me know what your favorite is! This was the end of the game for me. This is as black as black tea gets, so I started looking around. It started with Tazo’s Triple Berry, which I still drink every Monday morning, and quickly exploded from there. I started drinking tea every day, sometimes twice a day, and I just wanted to try all of it. But the only place I really knew where to get tea from was Target, and I wanted to get into loose leaf, so I got on the old Google, typed in monthly loose leaf tea subscriptions and found a few very expensive ones. Hm. That was not going to work. I know this sounds terrible, but I didn’t want to spend a lot of money on this. And I wanted options. A lot of these places weren’t allowing me to kind of customize my subscription a little. I didn’t want to get a surprise white tea! (sorry white tea and me are still on bad terms, you can blame a white cucumber I had one time YUCK) and I wanted to explore both more black and herbal. I kept searching, though, and that’s when I found it. If you follow me on any social media, you’ve definitely heard me talk about Plum Deluxe before. I actually recently took over their Instagram story for a week, as well, to talk about tea! How Plum Deluxe works is in different tiers. You can either get one or two CUSTOM MADE TEAS. Yup, you read that right. You are not going to find these teas anywhere else. Andy Hayes, the creator of Plum Deluxe, is an absolute genius and also one of the nicest people I’ve ever had the pleasure to speak with. You only pay $10/month for one tea and $16/month for two, and I literally love their teas more than anything. Right now, as I’m writing this, I’m drinking the Spa Blend, which is a mixture of lavender, lemon verbena, and orange peel. My absolute favorite of theirs is the Self Care Blend, though, which is honeybush tea, elderberries, apricots, apple, and marigold. Oh yeah. If the tea isn’t enough to convince you, Plum Deluxe is also just one of the greatest companies out there. Their customer service is outstanding, they’re super prompt with their responses, the newsletter is full of fun goodies, and they sent me my favorite teas after I finished taking over their Instagram story. I just really, really love them, and if you love tea, give them a look. They can be found on their website, and on Facebook, Instagram, and Twitter. This shelf is my pride and joy. Sadly, the creators are no longer on Etsy, but they were so wonderful and added in an extra shelf on the right side so I’d have more space to use. This is also not even all of it. Only my favorite mugs and tea are on display, and I have more mugs on top of one of my bookshelves and more tea in my closet. It’s just endless. I still drink Tazo, as you can see, and I grew to enjoy Yogi Tea a lot. Harney & Sons Tea is excellent, as well, and one of my go-to lemon teas is a Lemongrass from Teatulia that I got from Whole Foods. Most of the clear spice bottles are loose leaf from Plum Deluxe, but there are also a few from my other favorite tea company. Oh, hell. This is like one of those wild finds where I wasn’t quite sure how I’d never heard of this before. It’s hard to go out for tea. It’s easy to go out for coffee. There are coffee shops everywhere, and all of them sell a little bit of tea, but I find that generally if you brew coffee, you really don’t know how to properly steep tea. (The only time I will willingly drink Starbuck’s Earl Grey is if I’m desperate. Though I did try their Emperor’s Cloud & Mist green tea, and it was good, albeit weird.) My go-to place in Salem for tea was always Jaho, and by go-to, I mean I only went during their chaider season. (CHAIDER?! Apple cider and chai tea, YOU’RE WELCOME.) So, when a friend said, hey, you want to go out for tea, I thought that’s where we’d head, but we parked down at the Wharf and then walked up to the Hawthorne. Um, where are we going, I wondered. Like. Guys. I just can’t even describe my reaction the first time I walked in Jolie Tea Company in Salem. It’s located right across from the Hawthorne at the end of Essex street, and it’s a literal gold mine. When you walk in, there is not one, but TWO tea walls, one on the right and one directly ahead. There’s also a case of different flavored macarons (holy magic the Earl Grey one), the most decadent lemon scones, and seasonal cookies that’ll rock your socks off. And the madeleines! And, don’t let the tea walls fool you because there’s also the menu for more teas AND a full binder of teas that has over 100 different blends. I KNOW. Their tea is incredible. My favorite one sways rapidly between the Lemon Lavender Earl Grey and the Wonderland tea. Oh, but also the Secret Garden tea. Wait, Wonderland tea? I actually wrote a review blog about Jolie’s Wonderland line, which they are still selling, so get your butts on over there and grab some, and which I absolutely adored. And again, just like Plum Deluxe, not only is their tea amazing, their employees are just fantastic humans. They’re always readily available to help you pick out what you want, they’re excellent if all you say is “I don’t know, I like flowers and caffeine”, they’re just as excited about tea as you are, and they’re so, so kind and friendly. I unashamedly go there every single Saturday that I’m able to. They can be found on Essex St in Salem across from the Hawthorne, on their website, and on Facebook. I legit buy these Bold Drop tea bags over and over again. If you’re looking to get into loose leaf, this is the way to go. I’ve tried both metal mesh and rubber mesh strainers, and I don’t like either of them. I always feel like I’m chewing my tea as pieces tend to float out. 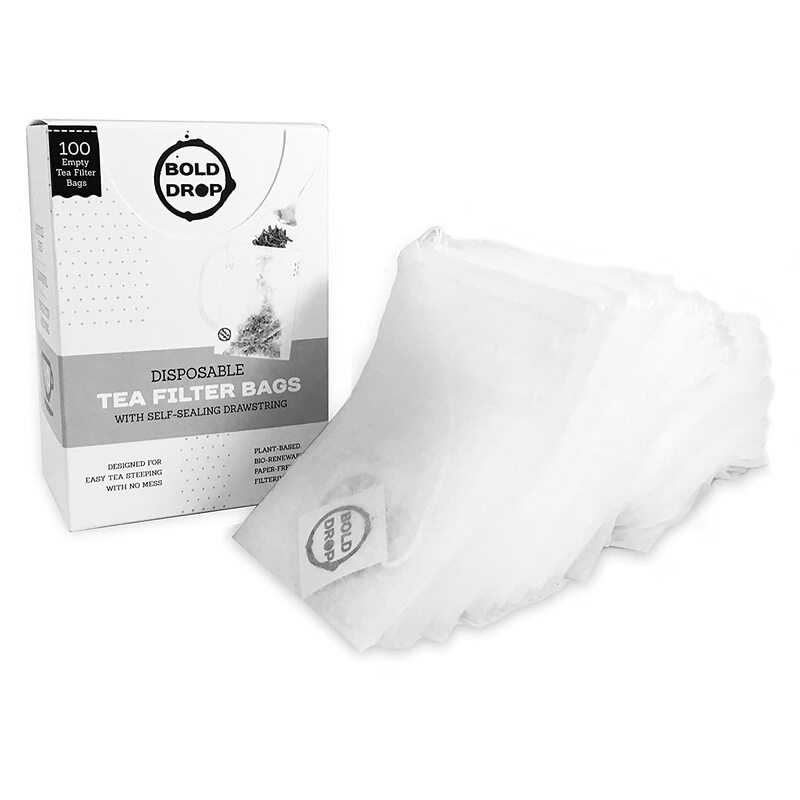 I’ve never tried a teapot with a strainer, but I also don’t really use teapots, so if you’re looking for a good replacement for your super cute mesh strainer that lets out little pieces of tea, these bags will be your best friend. And they’re biodegradable! And there you have it. 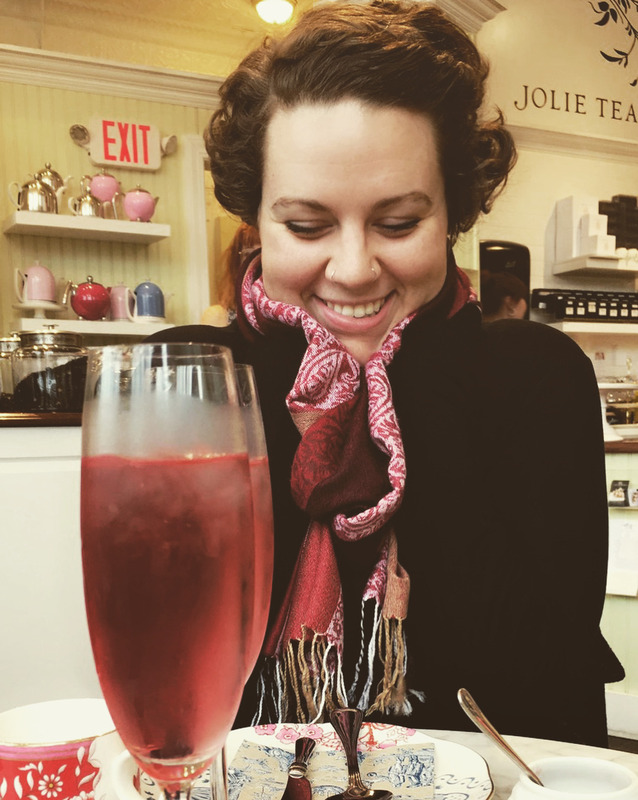 The Tea Blog, finally! For more tea adventures, check me out on Instagram, where I promise you’ll find a very odd mixture of yoga, cats, books, and tea. I don’t even want to admit out loud how much I paid for my Q scrabble mug from the UK.